Following Margay’s successful rebirth into the Canadian karting market over the past two seasons, Margay Racing and Le Circuit Quyon (LCQ) Karting are looking to expand their reach across the country by attracting new product dealers. With LCQ operating in Canada’s Capital Region (Ottawa-Gatineau), dealers are being sought for the remainder of Ontario and the Eastern provinces. There is also interest in having Margay represented in Western Canada. QUYON, QUEBEC--(Marketwired - July 10, 2014) - Gordon O'Connor, Member of Parliament for Carleton-Mississippi Mills, on behalf of the Honourable Denis Lebel, Minister of Infrastructure, Communities and Intergovernmental Affairs and Minister of the Economic Development Agency of Canada for the Regions of Quebec, and the Honourable Gary Goodyear, Minister of State for the Federal Economic Development Agency for Southern Ontario (FedDev Ontario), today celebrated the official re-opening of ferry operations between Quyon, Quebec, and Mohr's Landing, Ontario. The Government of Canada allocated up to $2,818,000 to the Mohr's Landing & Quyon Port Authority for the construction of the two ferry docking terminals. Of this amount, Canada Economic Development provided $1,518,000, while FedDev Ontario provided $1,300,000, both non-repayable contributions. Luskville Sector — Ministry of Transport Québec officials are hopeful that the bypass road being built alongside the washed-out portion of Highway 148 will be ready to go into service later this afternoon, relieving local residents and visitors to the Municipality of Pontiac from the one-and-a-half hour plus detour in effect since Tuesday afternoon. The bypass lane will accommodate one lane of traffic at a time, alternating directions by way of temporary traffic lights that will be put in place on each end of the newly created bypass lane. Mayor Roger Larose and Pontiac’s MNA André Fortin were both onsite monitoring the MTQ’s progress and speaking to concerned citizens. The Ministry of Transport Québec officials advise motorists to monitor the MTQ website for the exact time of the bypass lane opening. Transports Québec devrait terminer vendredi l'aménagement d'une voie de contournement autour du trou de 10 m de diamètre sur la route 148 près de Luskville. Le nouveau chemin de déviation sera beaucoup plus court que celui que devaient emprunter les automobilistes jeudi, un détour de près d'une heure. Stephan Paape remembers seeing the twinkle in his daughter’s eye after she discovered the bumpy surface of the moon through a telescope lens. To peer into the “inky black background of space really puts our own place and the Earth’s place in the universe into perspective,” he said. Paape, the president of the not-for-profit AstroPontiac, hopes to raise $12,500 by mid-August to build one of the first astronomy parks in the national capital region. The park is expected to be located in Pontiac, Que., roughly a 30-minute drive northwest of Ottawa. Luskville Sector — Following yesterdays Canada Day tornado microburst that left dozens of Pontiac homes damaged, the Municipality was dealt a new blow when another section of Highway 148 was washed out near the Luskville Recreation Park effectively cutting east and west Pontiac off from each other. The collapse occurred in the eastbound lane on the south side of the highway around midday and there were no reported injuries related to the washout. Ministry of Transport Québec officials are on scene assessing the damage and have not yet worked out a timetable for the length of the repairs. Motorists coming from the east-end of Ottawa are being advised to detour north via Highway 5 to Wakefield, then take the 366 through Masham to chemin d’Eardley, continuing towards chemin Eardley-Masham to the 148 in South Onslow, ward 3 in the Municipality of Pontiac. Drivers coming from Ottawa’s West-end are advised to avail themselves of the new Ferry in Quyon to reach wards 1,2 and 3. Unfortunately, the very badly warn-out logging road between Pontiac and lac La Pêche is the only northerly route available to detour around the current road closure. 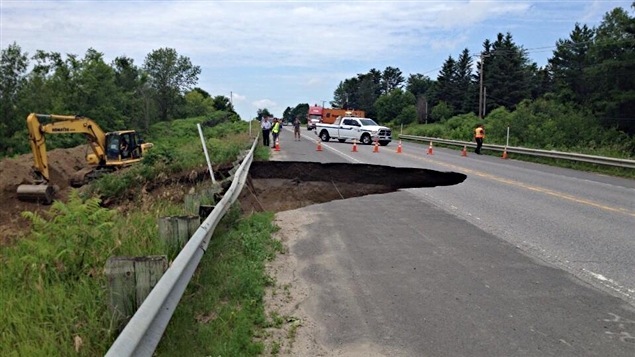 The Municipality has literally been cut in two by a small section of road and the excruciatingly arduous and dangerous detours caused by this closure — the latest in a string of similar road collapses that have plagued the Municipality of Pontiac for several years. Sources say that the Municipality had known of the potential for problems with the culvert passing under the highway and had brought the matter to the attention of the MTQ again last week. Coupled with yesterdays tornado storm, Pontiac’s first responders are very busy ensuring the public’s safety and cleaning up the mess brought on by the fierce storm. Today’s Road closure only adds to Pontiac’s woes. With the arrival of the summer season, area businesses will no doubt be hurt by the disruptions created by this vital artery being severed once again. Mainly because it TASTES GREAT. But also because... It is good for you, It is an excellent source of omega 3 fatty acids, it was raised without hormones or antibiotics; it was raised humanely, it is raised locally.